- Hi Fin , how did your career as a photographer start ? 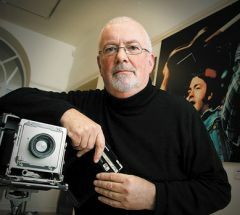 I first became interested in Photography in 1967 while working as a Merchant Seaman. I went to College in 1968 in London to study Photojournalism. While at College I started having pictures published in Newspapers and Magazines. - What kind of equipment were you using at that time ? Not having much money as a student my equipment was basic at the start. From Praktica-Pentax-Nikon and eventually Leica and Hassleblad. - When did you first hear about AC/DC ? About the mid ‘70’s, I did a lot of work for Warner Bros Records and they were on the label. The head of PR there (Moira Bellas) mentioned them to me then, though I didn’t shoot them until August 1979. - Can you please tell us when, where and how this photo shoot happen? Was it part of a specific project? It was for the cover of “Girls Got Rhythm” etc. It was the last shoot in my Camden Town studio before we moved to a studio in Islington. We had built a set for a shoot with the Tourists which was postponed and could not be shot in the new studio which was much smaller. This set included a glass wall and was to be the cover shoot for their album “Reality Effect” (A reference to a Jackson Pollock painting). I used the set and the paint for part of the AC/DC shoot instead as Bon kept asking me to “go mad and throw paint everywhere” since we were closing the studio anyway. - What was your first impression when you first met the band? any anecdotes? They seemed very quiet and except for Bon didn’t say much initially. After a few bottles of wine were drunk while we were doing the shot of Angus with the burning guitar, which had been used as a prop on a Boomtown Rats shoot a few days earlier, they loosened up and started to enjoy themselves. 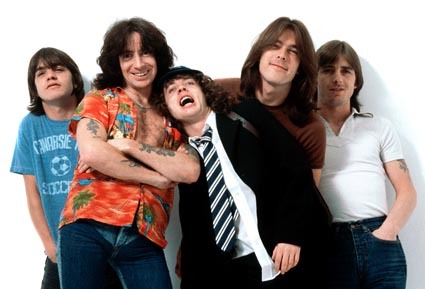 - AC/DC members are not known for loving to be in the spotlight out of the stage.. how did you manage to have them feel so comfortable? I think that as I was shooting bands like the Stones, Rush, Deep Purple etc they trusted me not to make them look bad or silly.The wine helped and anyway my assistants and I always had a lot offun doing it. - We believe you did not much have time to get familiar with the band. However, your pictures really captures all the band personalities. Bon loves the camera as much as Phil and Malcolm hate it..Did you immediately understand Bon & Angus were the ones to put in the spotlight? In my experience most musicians are stage performers and not very comfortable in a studio situation but you have to remember that this was the beginning of their career and they didn’t have much experience of that side of it. Angus and Bon were natural front men so it was easy for them. - Do you know you very likely shot the very first picture showing Angus on Bon's shoulder which has nowbecome "a classic" ? I didn’t do that one. I never shot then “live”.This was the only time I met them. - What about the Black and White vs Colour choice? At that time, what made you chose one or another? Looking back at the pictures now, what do you think of that choice? I always covered every shot in the studio and live, where possible, both in B/W and in colour.Some work better in B/W than in Colour. Personally I prefer B/W, but when you are hired to shoot a cover andthe attendant publicity shots you have to give the client both. - What are the keys, as a photographer, to manage to capture AC/DC's live energy in your opinion? As I said I never shot them live but with bands like the Stones, Zeppelin, Rush etc I always got into the music so I was able to capture their performance better. I was lucky in that over the 40 years of my involvement I was always able to choose the bands I wanted to work with and turn down the ones whose music didn’t appeal to me. - How hard is it to shoot Angus? does this involve some gear changes? If you mean trying to capture his stage performance it is the same as Jagger, Plant etc.They all have certain tricks and once you know them it’s easy. I always went to see a band play before I photographed them either live or in the studio.I didn’t use Zoom lenses in those days and had two Nikon F2 cameras and a 35mm and 105mm lens except where a particular wide or closeup shot was required.The less equipment you use the more I was able to concentrate on the session. - Have you seen the band on stage with Bon Scott ? As I said above I never saw them perform. - Do many other pictures from this session exist and have never been released? Has one of them a special history (refused for some reason, etc..) would you show it to us? Of course there were many pictures taken but the ones used were the ones chosen and I would not release any others out of respect.If they didn’t work then the certainly won’t work now. - What are your best memories as a photographer ? There were many over the years but seeing my first picture published has to be one of the best.It still is a buzz when I see a shot I like in print or exhibited. - What are your current projects ? I have retired from the music thing now except for doing a few shot for friends.I have recently done exhibitions of the musicians pictures but am now photographing the lives of the deep sea Trawlermen who work off the South Coast of Ireland (where I live) and in the Atlantic. 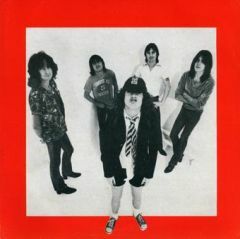 - Do you have a message for www.highwaytoacdc.com and its members ? Only that you should enjoy the music and not just that of AD/DC.There is a lot of good stuff out there and I am eternally grateful that I made my living from it for so long and saw some great shows and was involved in such great music over the years.